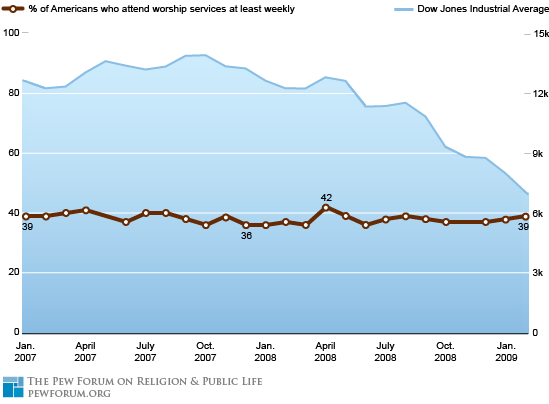 Contrary to recent media reports suggesting that the country’s economic troubles have led to higher levels of church attendance, a Pew Forum analysis of polls by the Pew Research Center for the People & the Press finds that while the Dow Jones Industrial Average has shed over half its value since October 2007, there has been no increase in weekly worship service attendance during the same time period. Worship attendance data from Pew Research Center for the People & the Press surveys. Market data through Feb. 27, 2009, from Dow Jones. Question wording: Aside from weddings and funerals, how often do you attend religious services… more than once a week, once a week, once or twice a month, a few times a year, seldom, or never?